Many of us think of spring when we imagine ourselves donning gardening gloves, straw hats, and muddy shoes for a trek into the garden to plant. But there is plenty of gardening that can (and should) start in the fall! At our annual Fall Plant & Bulb Sale, gardeners can browse hundreds of bulb varieties and ask our horticulturists for their expert advice. We had a few burning questions ourselves, so we sat down with Sonya Anderson, one of our horticulturists, to get the scoop. Why do we plant so many bulbs in the fall instead of the spring? Many bulbs, such as tulips, daffodils, crocus, hyacinth and many others, must be planted in the fall to get established in the soil and develop their root systems in preparation for optimal spring bloom. These bulbs also need to be properly chilled, which happens naturally while they are in the ground over the winter. What is the best time to plant bulbs in the Denver Metro area? In our area, it is best to plant bulbs in late September to mid-October. At this time, the soil temperature is cool enough that it won’t damage the bulb or “burn” the flower already developing inside, yet it also allows the bulb time to get established before frost. However, bulbs that bloom in the fall such as fall-blooming crocus and Colchicum, should be planted as soon as possible after purchasing. Are there any unique plants or bulbs gardeners can buy at the Fall Plant & Bulb Sale? We are very excited to offer Eremurus, or foxtail lilies, at the Fall Plant & Bulb Sale. These four-to-six-foot high flowering spikes of pink, orange, or white bloom in late spring to early summer and are one of our most requested bulbs. However, since these are harvested later in the season, we are not always able to get them in time for our sale, so we are very lucky to have them. Will there be any bulbs for sale that will bloom in the fall instead of the spring? Yes! One of our favorite fall-blooming bulbs is the Colchicum. These, as well as fall-blooming crocus, provide lovely, elegant color in the late season garden just as many other plants are fading. Plus, they’ll bloom the same fall they are planted, so you won’t have to wait long to see them peek out of the soil in your garden! Are there any special tips you’d offer to Colorado gardeners to help their fall-planted bulbs succeed? First, identify the garden areas where you want to add bulbs. Determine the sun, moisture, and soil conditions in these areas and purchase your bulbs accordingly to ensure the best bulb performance and longevity. Next, make sure your soil drains well to prevent your bulbs from rotting. If your soil is clay or otherwise not well-draining, be sure to amend the soil prior to planting. Once your bulbs are planted, water them thoroughly – do not skip this step! Then, cover the area with mulch to help protect the bulbs from heaving due to temperature changes throughout the winter. Finally, after your bulbs finish blooming next spring and summer, be sure to allow the foliage to die back naturally. This ensures that the bulb is strong for the next year’s bloom, increasing its longevity. 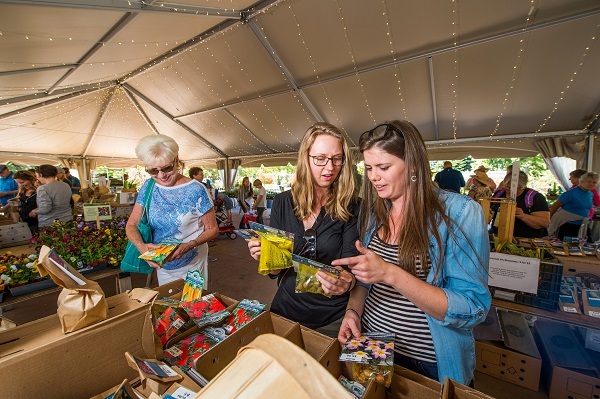 Stop by the Fall Plant & Bulb Sale this Friday and Saturday, Sept. 28 and 29, 9 a.m. – 5 p.m., to pick up plants and bulbs for your own fall garden. Free admission to the Plant Sale and to the Gardens both days. Members receive 10% off all purchases! Click here to browse our bulb catalog and learn more.